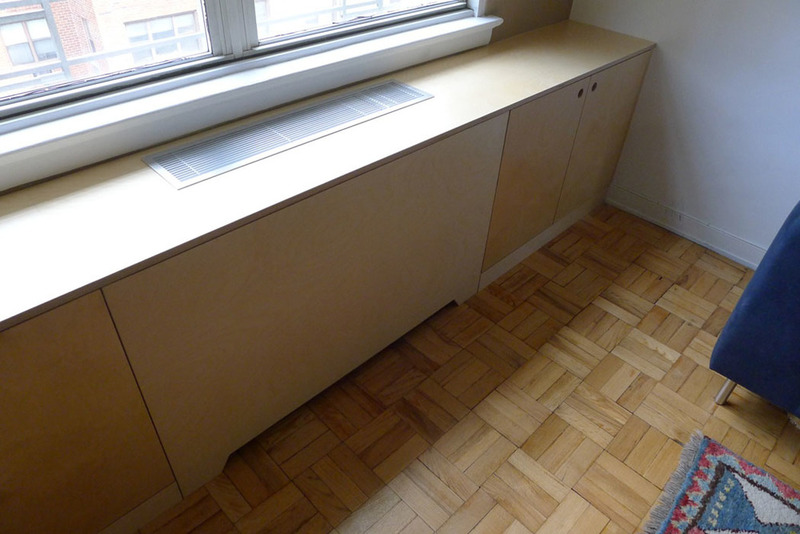 Throughout the years, we've constructed numerous built-in radiator covers ranging in materials and types based on the specific needs of clients. This conference table, constructed of bamboo, offers seating for fourteen. These movable cabinets on wheels serve a dual purpose, acting as a backdrop for this lingerie store's window display, as well as providing the store with a storage area. Constructed of painted plywood. For this wet bar/kitchenette on a rooftop in Dumbo, Brooklyn, we used marine fir plywood, which is an exterior grade wood known to be outstanding for use outdoors. It’s often used for boat interiors and, as it’s exposed to elements over the years, its color only improves, becoming darker and more rich. Sliding cabinet doors and discreet handles keep the piece looking sleek. The kitchenette is fully functional, featuring both a deep sink and refrigerator. 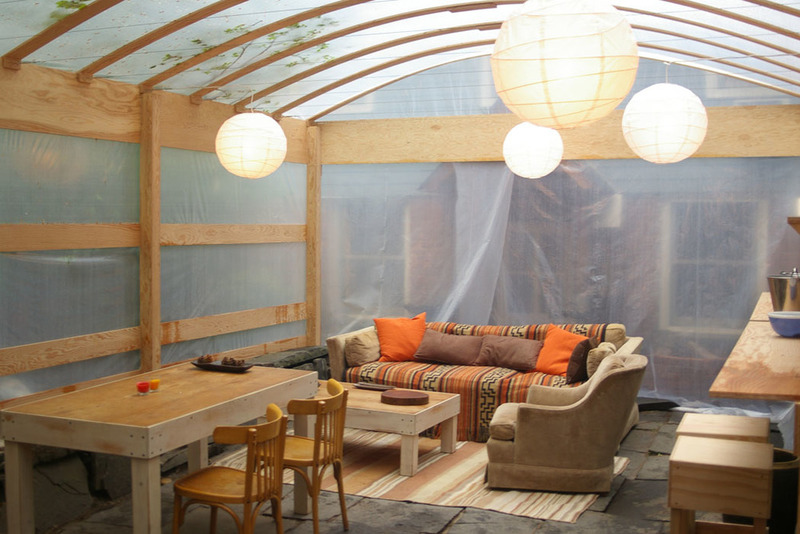 Made from marine fir plywood and transluscent plastic, this enclosure was built to cover the backyard for a party in Brooklyn. The main design challenge was that the space spanned 14 feet but the plywood was only 8 feet long. Our solution was to join 4" plywood strips with a small pieces of plywood and screws. This was then bent with a thin steel cable into the shape of an arch. These bow-shaped arches are light yet very strong since they are holding the internal tension produced by the chord. Six columns support these arches and shelves and counter tops were built in-between.